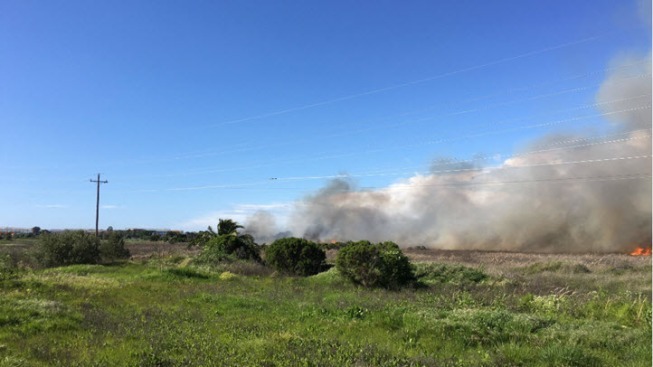 Firefighters are mopping up a two-alarm grass fire in Menlo Park that burned 13 acres Monday afternoon, according to a fire chief. Fire officials with the Redwood City Fire Department first reported the blaze, happening at University Avenue and Bayfront Expressway, around 4 p.m. The fire was mostly out around 6 p.m., with a few remaining hot spots and flare-ups, according to Fire Chief Harold Schapelhouman with the Menlo Park Fire Protection District. The blaze was confined to a marsh area which is home to a number of homeless encampments, Schapelhouman said. "It looks like it started at one of the encampments," Schapelhouman said. "The official cause is pending, but that's definitely very suspect." The fire briefly threatened power lines, but did not damage any structures. No injuries have been reported, according to Schapelhouman. University Avenue was temporarily closed at Purdue Avenue due to the fire, but it has reopened, Schapelhouman said.